Growing in Grace Podcast: 368. Confessing Sins To Be Forgiven? 368. Confessing Sins To Be Forgiven? One of the greatest burdens a believer can endure is the misleading doctrine of needing to constantly confess all of your sins in order to be forgiven. What happens if you forget to confess one (or many)? Taking one verse out context can bring misery into peoples' lives. You have been forgiven and cleansed of all unrighteousness through the blood of Christ and His finished work. Not through this Old Covenant practice of confessing sins to God. There may be a time when emotional healing is needed and as James stated we can confess our sins to one another. But in regards to God's forgiveness, that has already been dealt with by Him. This use to bother me for years, I was taugh that if you did not confess. then you were not forgiven. It was not until that God revealed to me that you confess cause you have been forgiven, as Colossians 3:13 says. I do have a question though, when Jesus says in the gospels, that if you don't forgive men of your trepasses,neither will your heavenly father forgive you, did that change after he died and was raised? I know that the law was still in exixtence in his ministry, the new testament did not bein until after he died and raised. Time and time again he referenced the law, but the new convenant did not come in existence after his death, buriel and resurretion. So when people use that scripture to justify the need to confess, do you tell them that was BEFORE the cross or what? Yep, that's how we understand it, Mike. 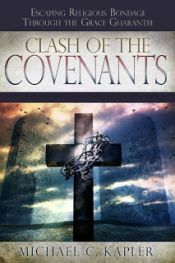 Many of Jesus' words were spoken in the context of the Old Covenant, to people who were under it. He was "born of a woman, born under the law, to redeem those who were under the law" (Gal 4:4-5), and this is what much (but not all, of course) of His pre-cross ministry consisted of. We've done some podcasts in the past in which we've talked about the Sermon on the Mount, which included the Lord's Prayer, and how we believe it was Jesus putting a magnifying glass on the law for the Jews, rather than it being a teaching that Christians are to live by. Here are a couple of podcasts in which we talked about this. Covenant Confusion #6: The Red Letters...Old Covenant or New? I will check those out,when I get the chance. You forgot 1st John 1:9 John tells us that we should confess our sins and that he will cleanse us from all our unrighteousness unless you want to say a believer never sins ?? ?